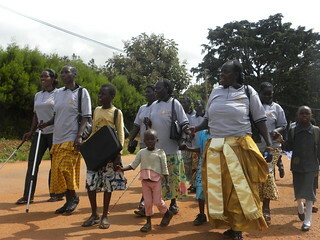 Persons with visual impairments march to raise awareness about the plight of persons who are blind. Others persons who are not blind marched with them in solidarity. They marched 5km to the main part of town to attend a White Cane Ceremony highlighting the importance of persons with visual disabilities to the community and the need to fill in societal gaps that result in inequities and suffering.